Everybody loves man’s best friend, but man’s best friend doesn’t always know how to love us! 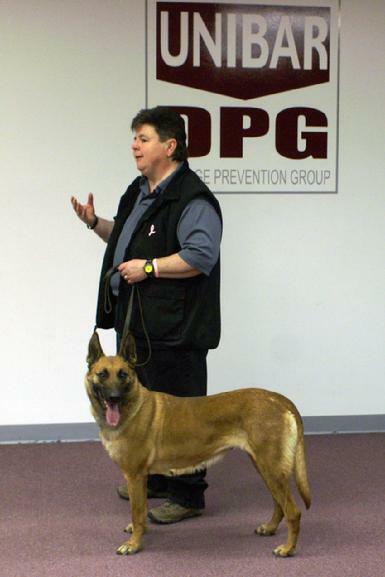 Cheryl Carlson, one of the best known dog training experts in the industry, offers a dynamic presentation using live dogs to demonstrate how to recognize and diffuse dog aggression. 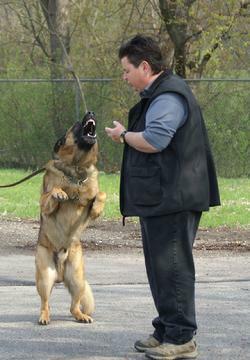 Basic behavior ‘drives’ of dogs are identified, discussed and demonstrated; and proper human reactions and defensive tools are offered to use if you find yourself in an encounter with an unfriendly neighborhood K-9. 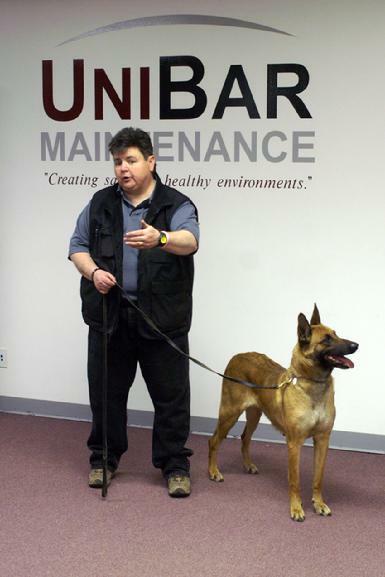 Cheryl Carlson’s 40 years of experience in training police and guard dogs, while specializing in the evaluation and corrective training of pet dog behavior and temperament, has made her a sought after expert witness in cases regarding the use and training of Police K-9, Dog Attack, and dog breeding. 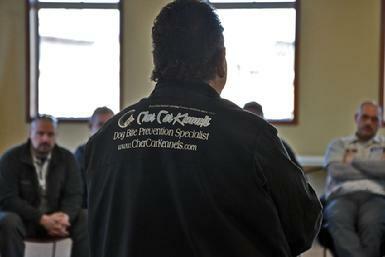 Cheryl uses this wealth of knowledge to customize her Dog Safety Awareness and Bite Prevention Training SEMINARS for the specific needs and dangers of each client; so, for example, Animal Control Officers will receive specific information that may not be given in her presentations to Meter Readers or Delivery Services. Major employers like DTE Energy, Consumer’s Energy, Arizona Public Service, Unibar Damage Prevention Group, GTE, Louisiana Gas & Electric, Duke Energy, Accu-Read Services, Michigan Consolidated Gas Company, Kentucky Utilities, Minnesota Rural Electric Association, Cinergy, Connexus Energy, Delmarva Power, Olameter Corporation, AT&T and the United States Postal Service regularly use Cheryl’s demonstrations in their employee safety meetings. 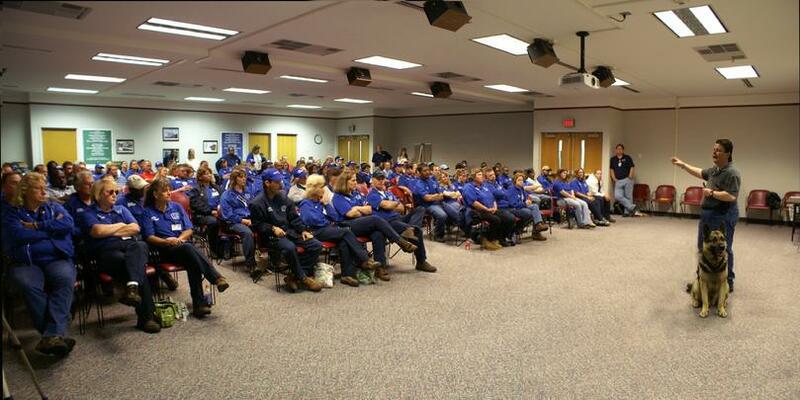 Humor, knowledge and excitement make sure her information is remembered and implemented by the persons who attend. 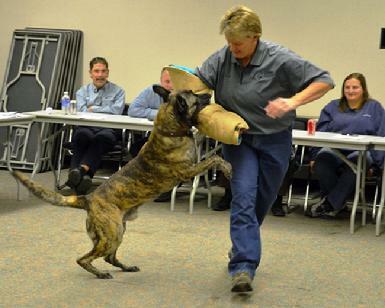 Consequently, these companies all report decreased on the job injuries due to dog bite, and the resulting work hour loss, due to her practical, hands on demonstrations. 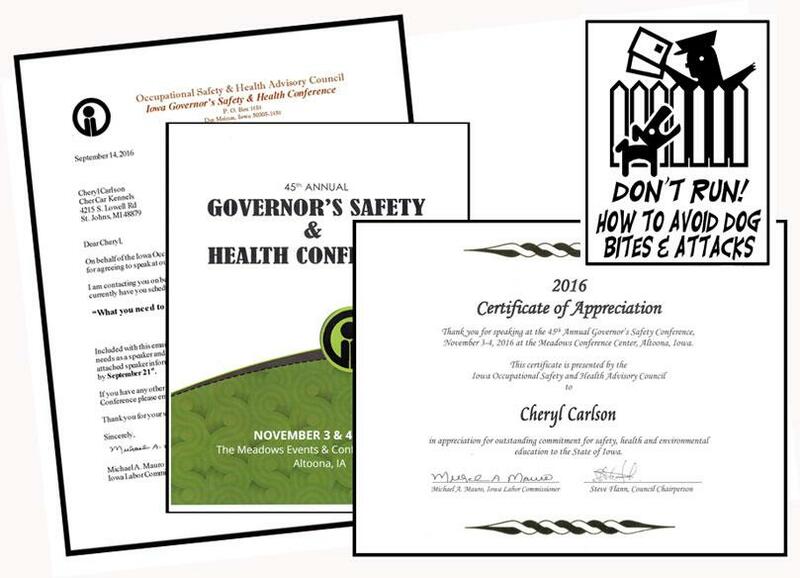 Why not offer your employees the benefit of Cheryl’s tremendous speaking presence and humor while teaching those skills to reduce risk and perhaps some day save a life! 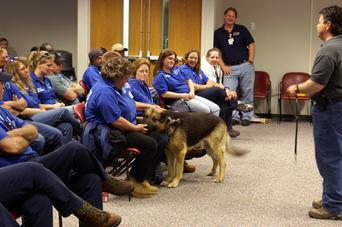 Dogs are the most prevalent hazard meter readers face. 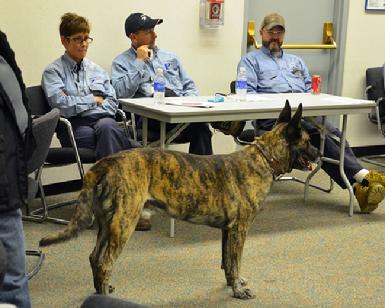 Cher Car Kennels regularly conducts seminars for DTE Energy throughout the state of Michigan training Meter Readers, Field Service Technicians, Line Locators and others how to avoid attacks, what makes dogs aggressive and how to use protective devices like dog spray. 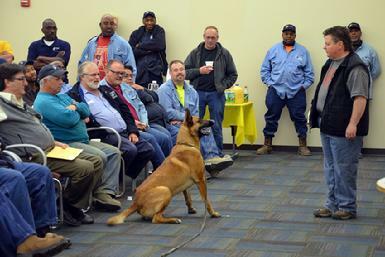 Dog Bites (once DTE Energy’s MOST recordable OSHA Incident) have now dropped to third, behind slips/falls and vehicle accidents… because of the skills taught their employees during our Dog Safety Awareness program. 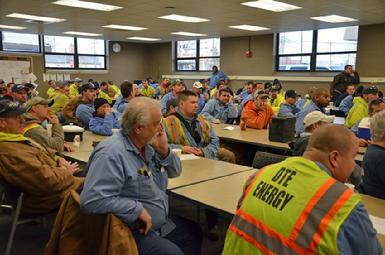 This Training Seminar was conducted for DTE Energy in Ann Arbor, Michigan. 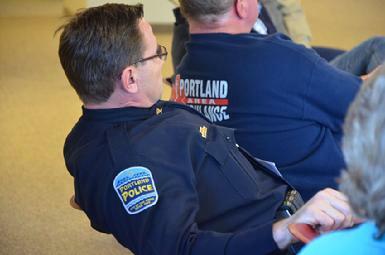 ... as well as Police, Fire and Emergency Medical Services personnel. ...and are taught physical behavior skills to avoid this outcome. 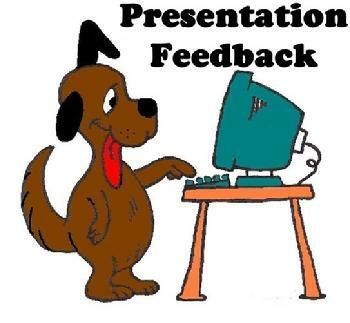 Demonstrations can be arranged by contacting Cheryl Carlson in the office at (989) 224-7225, on her cell phone at (517) 719-0208 or by emailing Cher Car Kennels. 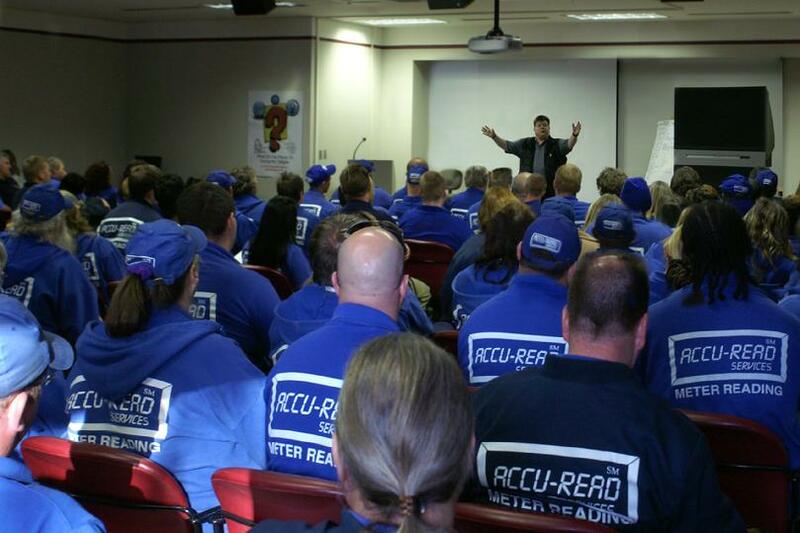 Seminar fee is $200 per half hour of speaking/demonstrations with mileage to and from location at 58¢ per mile. If location is more than 50 miles away, there is an additional $300 per day fee that Cheryl is away from the kennel business. Travel can be arranged any where in North America. Additional charges will include airline tickets, shipping of dogs, hotel, meals and rental car. Prices discussed on an individual basis. Please indicate that you are interested in the Dog Bite Prevention tape, as Cher Car Kennels offers other instructional videos for sale. The tape will be shipped priority mail. Allow 2 to 4 weeks for processing. 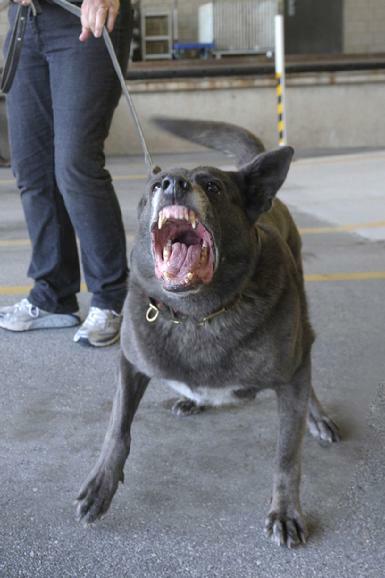 Here is a roll up of the feedback I gathered on the Dog Bite Prevention Training you provided to Arizona Public Safety employees on April 1, 2, 3, 2008. 1. The training was relevant to my job. It was up-to-date, effective, and challenging. Absolutely, it helped us to understand what dogs are doing. Makes you think. Makes you know what to look for while in the field working. She added things that are relevant to meter reading. 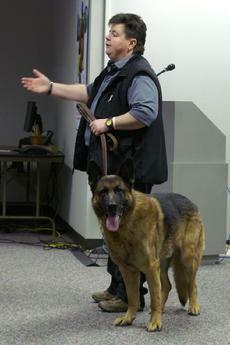 Beneficial, gives us an idea of what the dog is thinking, helps us to understand dog behavior. Good to have this training both as initial and refresher. 2. The training materials (handouts, transparencies, equipment, etc.) were useful and helped in the learning. The dogs were great. Seeing a live demonstration is far better than seeing it on a video. 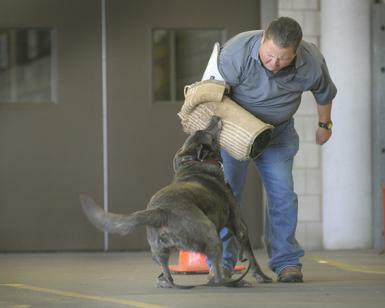 Watching it live gave us the opportunity to see the tremendous amount of force a dog uses while in an attack. 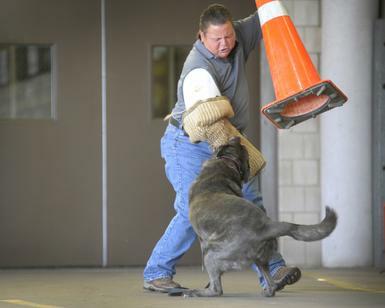 Seeing is believing, watching what to do in a dog attack is so much better than reading about what to do. 3. 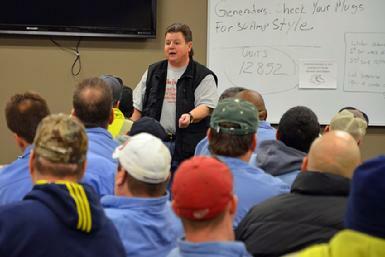 The training covered the topics I need to know. 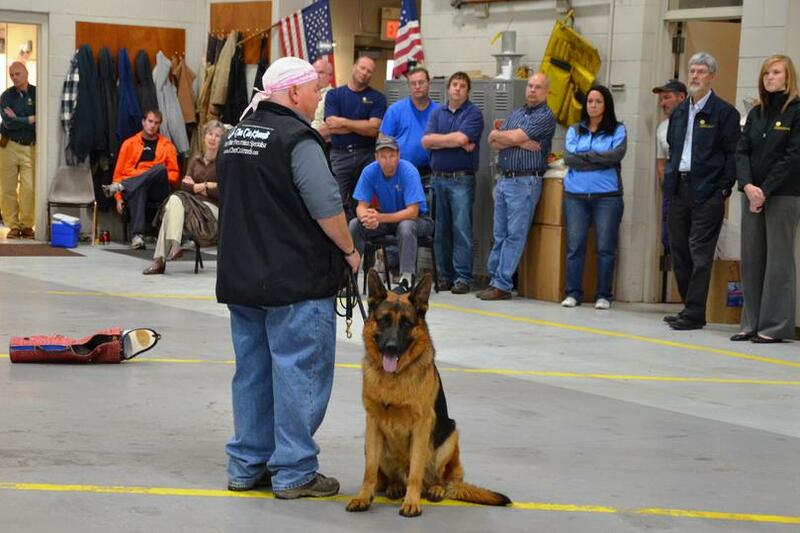 This training taught us what we need to know about dog behavior and how to deal with them. 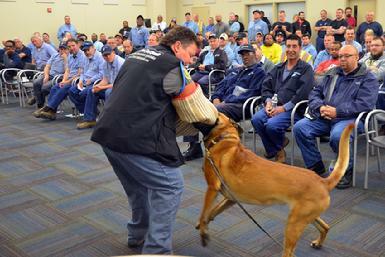 Understanding dog behavior is very important to our job safety. 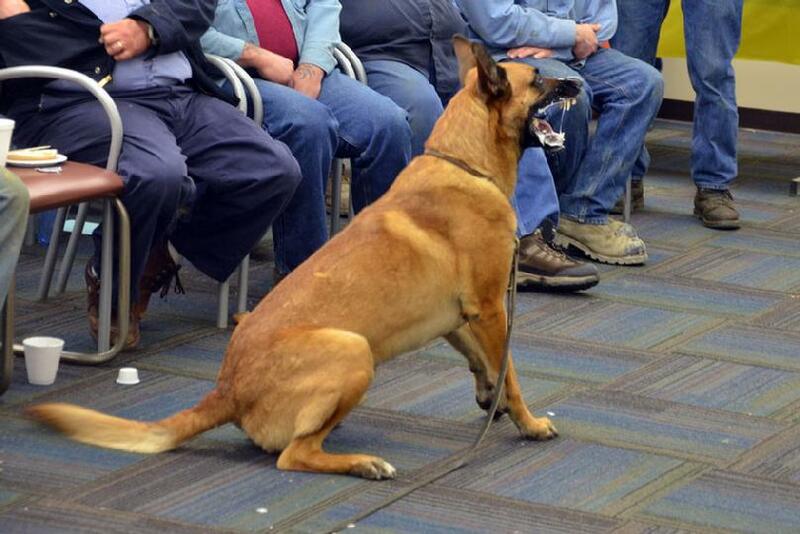 We are issued dog spray and it was good to be shown how to use it effectively. 4. The training material was communicated well with a good learning environment. I felt comfortable participating in class. Excellent speaker and presenter. Very professional and very understandable. Great speaker, good communicator, answered our questions. Made it fun to learn. Her real life experiences makes you know she knows what she’s talking about. It would be neat if volunteers from the audience could wear the sleeve and be attacked by the dogs. We had 5 classes at 3 different locations. Each location was set up differently due to the classroom configuration and she worked great with every setting. Did a good job answering questions. 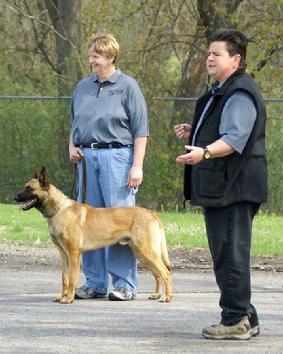 Cheryl & Russ Berringer of APS with demo dogs "River" & "Timber". 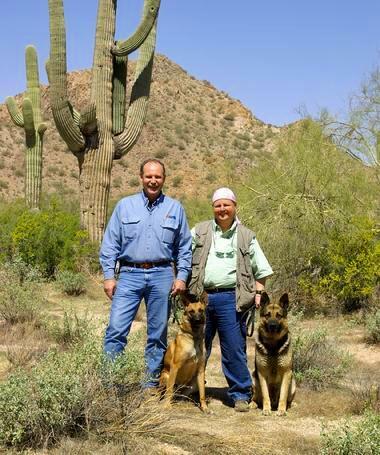 This photo was taken during an earlier May 2006 trip to Arizona, where Cheryl conducted dog safety awareness and bite prevention training seminars for the Arizona Public Services (APS) meter readers. 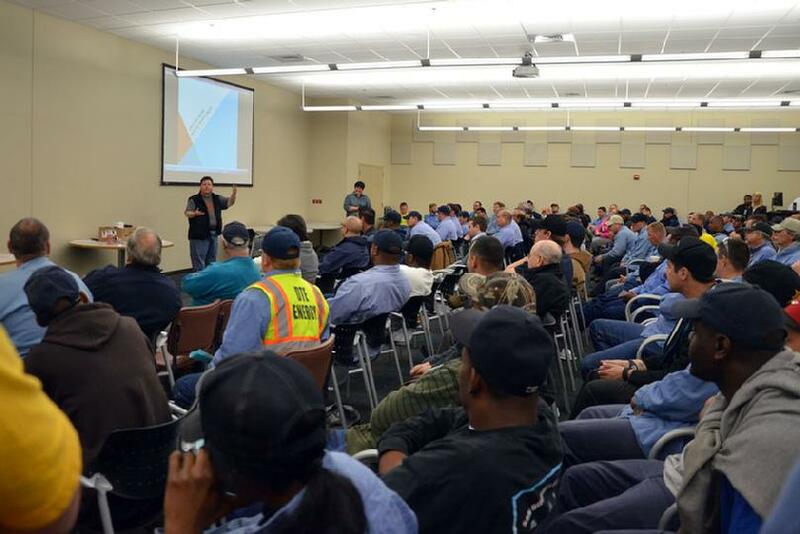 The nine seminars were conducted during a three day period in the towns of Prescott, Cottonwood, Flagstaff, Phoenix, Casa Grande and Yuma. It wasn’t all fun in the valley of the sun, as you can see by Cheryl’s telltale “chemo cap”. She had just completed chemotherapy after undergoing a double mastectomy. She IS a cancer survivor, thanks entirely to early detection; and urges all men and women to conduct self examinations and receive regular check ups and mammograms. Below are a few links for additional information.